After I wrote this post I talked to several people about the importance of making the distinction between learning and performing. 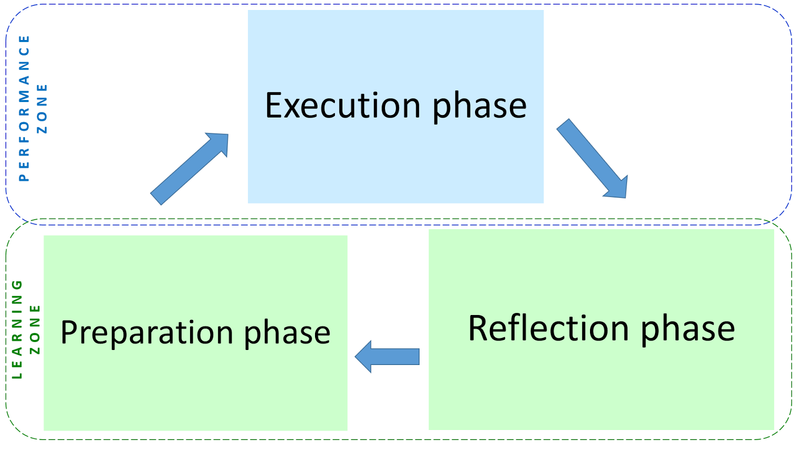 Most people I talked to found this distinction interesting and valuable and were interested in the three phases I mention: the preparation phase, the execution phase, and the reflection phase. Generally, people found these stages useful and they said they would like to pay more attention to preparation and reflection. To support this I have made a simple tool which reflects those three phases. For each phase I have written down five bullet points. In the execution phases there are five points of attention to get the most out of your performance. 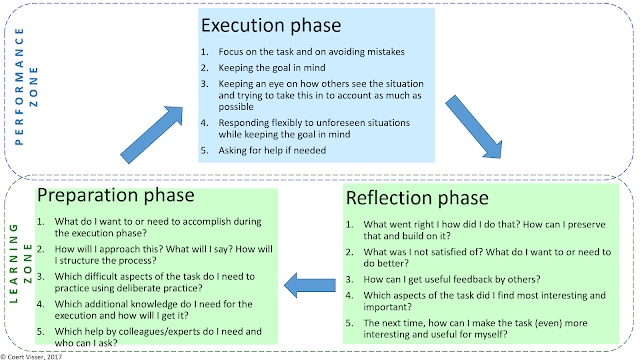 In the preparation and the reflection phase there are five questions which you can use. The figure below show this tool. If you want to you can try and use this model. You can do this by choosing a task which is important to you in your work and which you think you can or should learn more about or get better at. My suggestion is to print the model. Start wherever you like (preparation, execution, reflection). Choose a starting point and walk through the bullets one by one. Take notes while you do this. Walk through the complete cycle at least one time but preferably multiple times. After you have done this write down if the exercise was useful to you, and if yes, how. I'd be interested to hear what you experiences were and perhaps what your suggestions are. You can send them to coertfvisser50@gmail.com. Learning and performing, both the facts are quite beneficial for people. It helps to boost our knowledge and experience, through learning we can easily develop our skills and improve our performance. Basically, professionals are taking some valuable lessons from these kinds of articles to develop their learning and performing skills. Here in this article also, we learn some basic points about learning and performing and how to gain success through these strategies. Thanks for this wonderful and essential article.